On Wednesday July 27th 1983, during the main factory shutdown, the largest fire in R.A.lister's history occurred at the Dursley works. It started at lunch time in the main office block and burned down the Commercial, Financial and Parts and Services Offices together with the pipe shop and the Applications workshops. The Sales and Marketing departments were also badly damaged. The fire was attended by Lister's own Dennis fire engine and others from local brigades, all of them doing a sterling job to contain the blaze. However all-in-all 75,000 sq.ft. of workshops and 50,000 of office buildings were lost requiring temporary replacements or use of alternative space in other existing buildings. Recovery was rapid despite the damage. By 8.30am the following morning the computer system was back in action. The telephone exchange was a casualty of the fire but by Thursday three lines were operating and by the following Monday twenty-four lines had been connected. On that day also, new telex and computer terminals were delivered and became operational. Ten days after the fire, the main factory workforce returned, with those working in the pipe Shop or Toolroom having to relocate to new buildings. However through all this, there was actually very little direct impact on customers, old or new, due to the fire. The loss of the main offices was a blow but led to the construction of a new purpose built administration building, Drake House, which opened in early 1986. Unfortunately, in 2003, the building is no longer used by Lister's, although it is occupied by another company. Lister's fire brigade first started in the mid 1920's, their first engine being a Morris Commercial. At the time Lister's also gave fire cover for the whole of Dursley Parish Council. Other serious fires attended to by the brigade include one in the Harrowland in 1963 and a serious one in March 1930 when the original Lister-Bruston generating set department was gutted. A full report of the fire at R.A Lister is available for download in PDF format. Further details of Dursley's Fire Brigade history can be viewed by following this link. 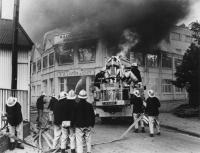 The fire soon took hold of the main office block and rapidly advanced through the building making it difficult to fight until more resources had arrived on the scene. 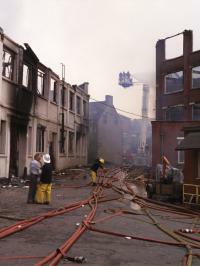 As the heat built up, burning embers crossed the gap to the Churn Works building which was soon well alight. Being used latterly for the production of woodware items it was soon engulfed by flames. The fire fighters from around the county continue to damp down the fire which has by now destroyed the main office block seen in the background. The flames take a strong hold on the office block as the firefighters try to keep it from spreading. Fire engines came from far and wide to attend the blaze at R.A.Lister. Just the walls remain of the most affected buildings as the firemen finish the job. Water continues to be played on to the fire to finish off the last of the flames. The shell of the main office block and the extent of the damage done is clearly seen in this view. The whole of the top floor of the Churn Works building has collapsed and is open to the sky as the fire fighters tidy up the hoses. There's going to be no work done in this office block today. The hard work is over and the only thing left to do is collect up the equipment and leave the scene. Little remains of Lister's office block on the day after the fire. The twisted girders of the destroyed structure make a sorry sight. It was demolished soon afterwards. Lister-Petter's 1972 Dennis fire engine. An early shot of R.A.Lister's fire brigade with their 1926 Morris Commercial.